Who decides who’s cool? Snapchat refuses to recommend accounts for fear of feeling heavy-handed. Maybe it learned from Twitter, whose old one-size-fits-none suggested user list immediately made it noisy, impersonal and ruled by an oligarchy. But Instagram is betting that algorithmically personalized suggestions could make its new ephemeral slideshow Stories feature addictive… even if your friends are boring. Today, atop the Explore tab, Instagram will start showing some users a bar of Stories from accounts you could follow, with the feature rolling out to everyone soon. Based on who you follow and the topics you care about, the tailored recommendations will make it easy to add someone new to your Home feed’s Stories section. The suggestions are sure to get plenty of attention because Explore is surprisingly popular. Instagram says 100 million people visit it every day — the first time it’s revealed a stat about Explore. 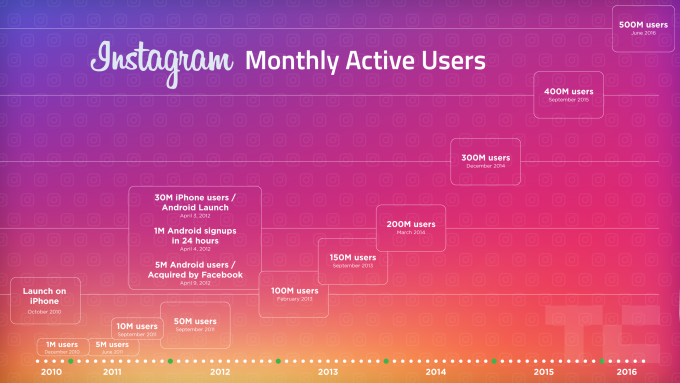 That’s one-fifth of Instagram’s 500 million monthly users, and one-third of the app’s daily actives. Beyond being entertaining, Explore helps people keep their feed fresh with new accounts. That’s critical after six years of photo sharing. This follows Facebook’s strategy of using artificial intelligence for curation instead of humans, like it just started to with Trending Topics descriptions. Algorithmic suggestions will allow personalization of Explore Stories at scale. When the tab was first launched, it was called Popular and merely showed the most Liked and commented-on posts across Instagram. That ended up too skewed toward generic iPhotography, so the Facebook-owned app began personalizing Explore in 2014, and eventually started showing trends and themed playlists of videos. Now Explore could give Stories a boost as it competes with its forefather, Snapchat Stories, which Instagram CEO Kevin Systrom told me deserves “all the credit” for pioneering the ephemeral slideshow format. Explore enhances Instagram’s biggest talking point here — that more people already have an interest graph and audience on Instagram than Snapchat. He recounts how his favorite story yet has been basketball star LeBron James showing himself lonely and eating cereal on a rented yacht. “Stories removed the fear of over-posting or worrying about Likes and comments,” Barnes explains. After of month of using Instagram and Snapchat Stories, Instagram’s product clearly lags behind. Uploads don’t always get added properly, the lack of colored text is annoying and I miss the selfie lenses and geofilters. Yet I’m getting more of my real friends watching and replying, and the rewind feature makes consumption easy to control.